Please join us in the forum while we work on the website. Seems back to normal this morning, thanks for your work LO. After nearly 7 years of using Proboards I have decided it is time to move to a forum that I host myself. I won’t bother getting into the reasons for the move, but I will say that I think this new software will benefit everyone. If you haven’t already done so, please join today. The Proboards forum has been closed for posting and new registrations, but will remain as an archive. 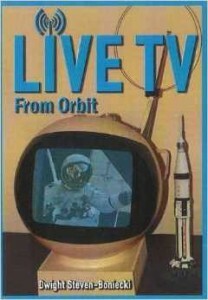 Our friend Dwight Steven-Boniecki has published another book titled “Live TV from Orbit”. This time the subject is the television systems used for Skylab, ASTP, and the Space Shuttle. In this day and age when we can watch high definition video of a spacecraft docking with the ISS, streamed almost instantly to our mobile phones, it is easy to forget that many technical hurdles had to be overcome to make broadcasting video from orbit possible. I want to personally thank Dwight for helping to preserve the history behind such an amazing feat. And yes, I am very much aware that Dwight has published more books in the last four years than I have published blog posts. And both of my blog posts are about his books. The often overlooked missions of Skylab, ASTP and the Shuttle categorically receive the recognition they have long deserved. Live TV From Orbit presents the planning and development of the TV systems used on those flights and summarizes the TV coverage during the respective missions. Engineers and planners involved with NASA, Westinghouse and RCA help complement the detailed analysis of just how much effort went into bringing some of the most important historical video from Earth Orbit to the everyday person’s living-room. Using the internal memos and status reports as its foundation, this book digs deep to uncover the story which unfolded behind the cameras. Unlike the days of Apollo, NASA had to fight against the growing apathy of the general public, and despite this hurdle, managed to deliver many iconic moments in outer space with a glorious clarity which had never been seen before. Having set the benchmark high for the lunar missions, NASA planners had to push it higher to win the hearts and minds of potential viewers.